It all started back when Shigeru Miyamoto first started working for Nintendo in the 80's. He was originally going to make a popeye game but Nintendo's license fell through. Shigeru came up with some new characters, Jumpman (soon to be Mario) and Donkey Kong. The idea for the name Kong came from the movie King Kong and the 'Donkey' part apparently meant stupid according to a Japanese/English dictionary. After the sucess of the original, a second DK game was made for the arcades. 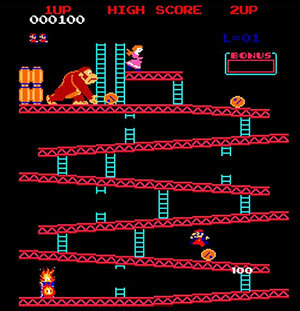 It was called Donkey Kong Junior, the aim of this game was the same but the roles had been changed a little. 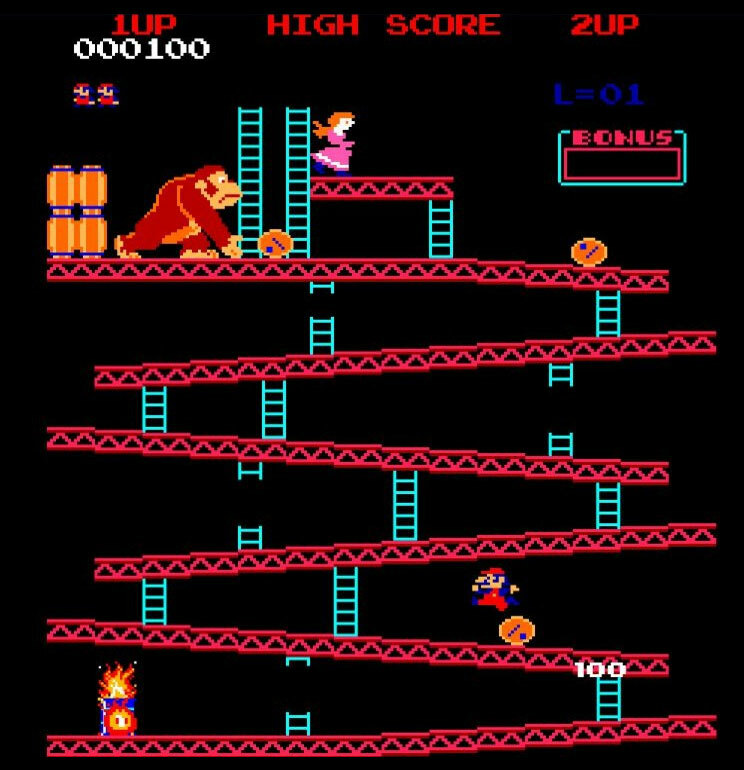 You played as Donkey Kong's son and you had to rescue Donkey Kong from Mario who had him locked up in a cage. Then came Donkey Kong 3. 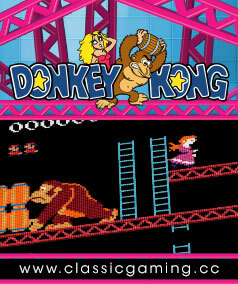 After the arcade titles, DK moved onto the Famicom (NES). A total of four games were made for the NES and most of them were in the same style as the arcade versions. DK disapeared until 1994 when Nintendo handed the DK franchise over to Rare. 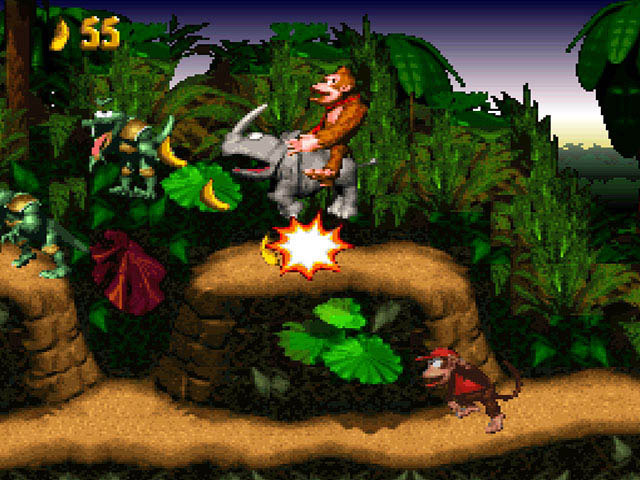 The first DK game Rare made was Donkey Kong Country. This game was very different from the Arcade and NES games. Rare brought in a lot of new characters including family members and bad guys and it was one of the first games to use ACM (Advanced Computer Modelling) graphics (the same thing used for films such as Jurrasic Park and Terminator 2). In DKC you could play as two different charcters, Donkey Kong and Diddy Kong (Donkey's best friend). The aim of the game was to make your way through a variety of different levels such as jungles, forests, underwater and factorys to take back your banana hoard which was stolen by the evil reptile King K. Rool. After a certain amount of levels you had to fight a boss. Most of the bosses were larger (and harder) versions of common enemys in the normal levels. Once defeated you you gained more bananas to go back into you hoard. In some levels you could also ride an animal which each had their own strengths such as Rambi the rhino who could break through some weak walls. This game has been hailed by some as the game that saved the SNES. After the immediate success of DKC, a sequel was inevitably in the works. The sequel was named Donkey Kong Country 2: Diddy's Kong Quest. 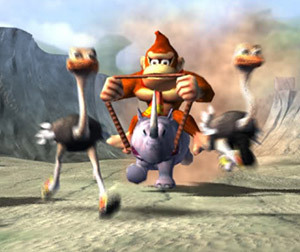 Instead of Donkey taking the lead role, he took a back seat in this game and let Diddy be the star. Well he didn't really have a choice because he had been kidnapped by K. Rool. 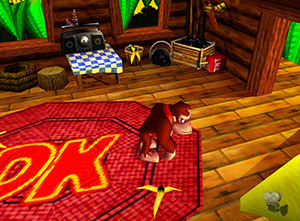 In this game the newcomer was Dixie, the object of Diddy's affection. The second installment had the same idea as the first except there were different levels and characters. DKC 2 had a strong pirate theme to it. Most of the enemies were dressed a pirates and alot of the levels featured ships and piratey things. The bad guy was the same as the first, K. Rool was back, but this time with the name Captain K. Rool. This game brought in a couple of new features such as DK coins and Banana coins. To complete the game fully you needed to collect all of the DK coins and when you reached a certain amount you could access a secret level. The Banana coins were there so you could buy things such as advice from Cranky and his wife Wrinkly. As with its predecessor, this game was also a hit. Some people see DKC 2 as the best game in the DKC trilogy. Rare's last SNES game was Donkey Kong Country 3: Dixie Kong's Double Trouble. This time it was Dixie who took the lead role and the newcomer was Kiddy Kong. 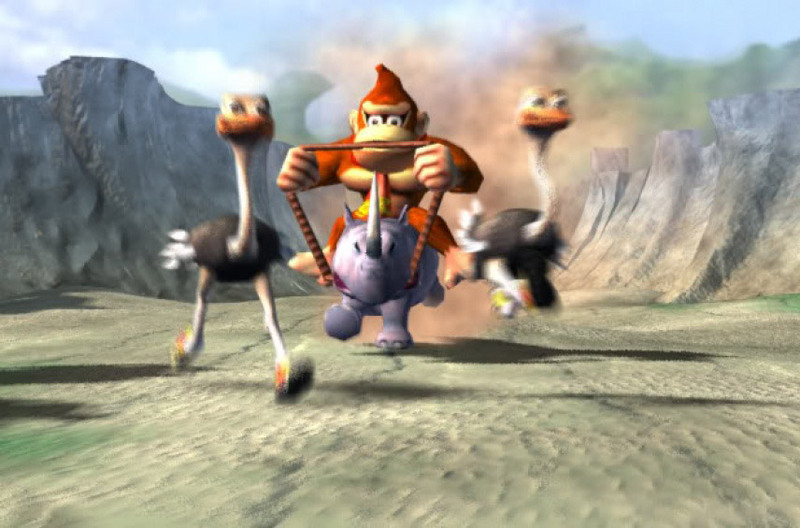 Once again K. Rool (this time he was name Baron K. Roolenstein) had kidnapped Donkey and Diddy and it was up to Dixie and Kiddy to save them. This game was in the same style as the previous two except with different levels and bad guys. Funky Kong plays a bigger part in DKC 3. In the last 2 games he was able to fly the Kongs around in his plane but now he had access to a wider variety of vehicles to help the Kongs on their quest. All the Kong's needed to do was find some parts so he could finish the vehicles. The vehicles in DKC 3 were indisposable as they helped the Kongs reach different areas of the map. Another classic for Rare to add to their games library. Onto the N64 then. Donkey Kong hadn't really been on much N64 games up until the relase of Donkey Kong 64. He featured in Mario Kart and a few others but Rare hadn't made any DK games apart from Diddy Kong Racing. Diddy Kong Racing featured some Rare stars of the future (Conker and Banjo). Donkey Kong fans were crying out for a DK game but Rare was staying quiet. There were Rumours going around of a game called Donkey Kong World but Rare denied all knowledge that such a game was in development. It wasn't until February 1999 that a mysterious screenshot of Diddy Kong in a minecart was released confirming that a Donkey Kong N64 game was in the making. The game was showed for the first time at E3 that year and the version shown was playable! The game was 3D platformer in the same style as Mario 64 and Banjo-Kazooie. There were a total of 8 levels in the game and their were 5 playable characters (Donkey, Diddy, Tiny, Chunky and Lanky). You had to use each character on every level collecting a certain colour of banana for each. Each character had their own strenths and weaknesses so there were certain parts of a level where only one Kong could go. Instead of Mario's Stars and Banjo's Jigsaw pices, the Kongs had to collect golden bananas. There were 201 of these in total (5 per Kong per level plus a bonus banana). Hidden in the game there are playable versions of DK Arcade and Jet Pac (one of Rare's Spectrum games). DK64 was released in time for Christmas of 1999 filling in the wait for Perfect Dark. The game required the use of an expansion pak and therefore the game was packaged with one. The only problem was there was a $60 price tag on it. Donkey has appeared on alot of Nintendo titles after DK64 such as Mario Tennis, Super Smash Bros. and Mario Golf and Mario Party. Mario was originally a carpenter, not a plumber as he became later with the introduction of Mario Bros. 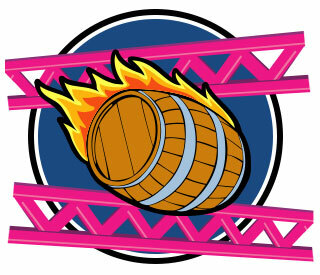 The word "donkey", in Donkey Kong, is a play on the Japanese word for "stupid". Pauline is the name of Mario's girlfriend in Donkey Kong. In the Japanese version, her name is Lady, but she got her name changed when Nintendo released the Famicom version. Another story on how the game's name evolved was that it was supposed to be "Monkey Kong", but due to a barely legible fax transmission, the screenprinters created thousands of pieces of artwork that read "Donkey Kong" instead. Since the manufacturers were in a rush to get the game released, they opted to change the game's title rather than wait for the artwork to be reprinted. This game appeared in an episode of Mister Rogers' Neighborhood where a young boy explains a little to Fred Rogers what the game is about and how it is played.